Welcome to the last View From Here guest post! Today I bring you Shell of Things I Can't Say, which was one of the very first other blogs I discovered when I finally noticed that blogging was such a big thing. Since then, Shell has been a bit of a bloggy mentor to me, just by doing what she does, by her example. In fact, she's such a cool blogger that, with help from a few other bloggers, Shell recently launched The Soccer Moms, dedicated to parents of active kids. Really great idea for a blog! I think Shell's post for us is a perfect note to end The View From Here on. It’s so easy to make assumptions based on what we see of someone. The way they look, dress, the car they drive, the house they live in, their kids, what we see them doing. And we often think they have it easier than we do. Because we struggle and look at her, she obviously doesn’t. What I’ve learned, first in my years of teaching and then in my years as a mom, is that we very rarely know anyone’s story. We see the smile and figure that everything must be just fine for someone else. I’ve been that one with the fake smile. Smiling because it would stop anyone from asking me what’s wrong when they’d see a frown on my face. And if they had asked, I would have fallen apart. Far from the “Oh, I’m fine” response that most people expect when you ask them how they are. I’ve been that close to falling apart when you wouldn’t know it. So, I don’t go by what others show to the world and assume they are just fine. It’s too easy to fake being fine when you really aren’t. Knowing this, knowing different struggles my family has gone through, the rough times friends have had, the tough times the families of kids I’ve taught had to go through…. I’ve learned not to take too much right at face value. That anyone around me could be having the worst day, struggling to just put one foot in front of the other without falling apart. So, my view from here, or my goal anyway, is to see others with kindness and compassion. Not to assume that someone else has everything so easy or to roll my eyes if someone seems upset over what I think is nothing. Because I don’t know. I don’t know what they are having to deal with. And whether it’s something huge and life-changing or it’s just some small irritation, being kind is always the right way to approach someone. We all have our struggles. Judgement or dismissiveness isn’t going to do anything to help anyone. 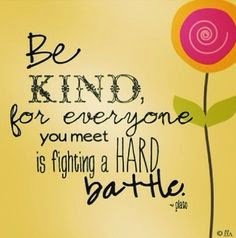 And while kindness might not always help, it might, and it certainly won’t hurt. My regular readers should recall a post I once wrote imploring everyone to stop being judgy. So yeah, I completely agree with Shell. Please go to her links, say hi and tell her I sent ya! It has been a great year featuring 49 great bloggers (I was one of them and there was no post one week). I sincerely hope you've enjoyed the journey too! Remember, I've started a new question and answer series called Ask Jen, so ask me anything....I just might give you an answer!